Wild Boar Mountain is an absolutely stunning mountain retreat, located in the midst of 2 hectares of land in the countryside of Bedarieux. There are 4 separate properties in this retreat, each one as beautiful and original as the next. There is the main house, a summer house, a tree house and a shepherd's hut. With a private infinity heated salt water swimming pool complete with a cave and waterfall, this is the most stunning property you could ever wish to stay in. The property is totally private. Two hectares of land set in the mountains on the borders of Languedoc National Park with breathtaking views. This is the place to just be and relax. It is a self-catering rental property and a perfect location for film shoots. Nearest town and shops are about a 10 minute drive. The land is over two acres and is surrounded by trees and mountains. For any explorers and keen walkers this is a haven in the south of France. There are plenty of walking trails leading from the property. Enjoy numerous sunny terraces or shaded areas and a large fenced pool with waterfall, all with views from every angle onto the valley and mountain. Whether gathered around the kitchen, dining together on the terrace, enjoying an aperitif, or lounging by the pool, the feeling of space, tranquility, and authenticity make for a truly memorable holiday experience. The property is surrounded by vineyards, olive orchards, cherry trees. Although there are four properties, guests will normally stay in the Main House and the Guest House. The main house has 2 bedrooms and a sofa bed and can sleep up to 4/6 people. The rooms are very bright, airy and spacious with a very modern feel to them. The kitchen is extremely modern and has everything that you will need to cook a delicious meal using local products. French doors lead into the kitchen which has 2 fridge freezers, induction hob and oven, Nespresso machine, microwave, dishwasher. The lounge area has a a corner sofa, TV, aircon, log fire and doors to terrace. Dining area has a table and 4 chiars. The bedrooms each have a double bed, one bedroom has 2 windows and a skylight, a fitted wardrobe and a TV. Outside, you will find a large private terrace with outdoor dining facilities; this terrace offers the most stunning panoramic views of the surrounding mountains. There are sunbeds and a BBQ here as well. There is also an outdoor seating area with similar breathtaking views and comfortable sofas, making it the perfect place to have a relaxing glass of wine in the evening. Exterior lighting. The Guest House is smaller than the main house, and has 1 main room with kitchen area, sofabed and desk space, 1 bedroom, 1 very modern shower room. It sleeps up to 4 people. The rooms are bright and spacious, quite modern yet very homely thanks to smart decor. Door to rear terrace with table and 4 chairs and lawn with sunloungers. There is an outdoor dining area on a wood decked terrace with lovely views over the grounds and exterior lighting. The entire property is very private thanks to the surrounding mature plants and bushes. Air-conditioning and internet. The Tree House is absolutely stunning and everything you could ever want from a tree house. Located high in the trees, this property offers total privacy and comfort. There is only 1 bedroom in the tree house, with a double bed to sleep 2 people and is probably best suited for a couple of days fun experience. Everything is made out of wood, including the kitchen which is fully equipped. There is a terrace with outdoor dining facilities, wooden stools and a table as well as lights and a heater. Shed with kitchen equipment of a fridge, basin, kettle, cupboard. Outdoor shower with hot water and shower shelves. BBQ fire pit. Seating under treehouse with table and 4 chairs. Probably best used just as a fun experience, rather than for the whole week. More suited to older teens/early 20's. The Shepherds Hut is very private and is literally a hut made out of stone, walls and floors included! It consists of just one room with a kitchen area, a bench sofa and 2 single beds. It is rustic but has electricity. It can sleep only 2 people and is extremely basic, offering the most beautiful views of the mountains. There is no bathroom here, only use of the bathroom in the main house. Outside is a bench, a large BBQ area and a picnic table. Probably best used just as a fun experience, rather than for the whole week. More suited to older teens/early 20's. The grounds of Wild Boar Retreat are absolutely breathtaking, with over 2 hectares of wild grounds, you will be surrounded by an oasis of mature plants and trees. The views that this property offers are just perfection, views of the surrounding mountains and Languedoc National Park. There is a private heated infinity salt-water swimming pool with a cave, jets, lights and a waterfall. It is 7' deep at one end and shallow at the other. 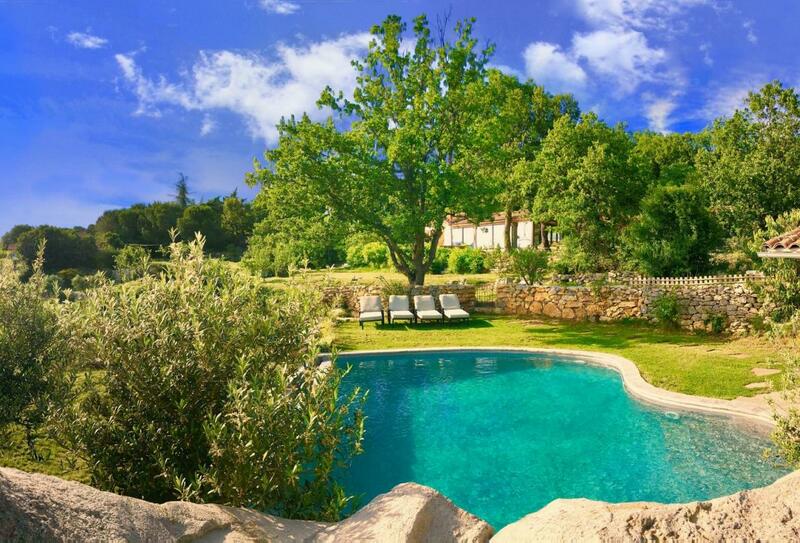 Olive trees surround the pool and there is a magnificent view over the countryside. Grassed area by the pool and a shower with basin and WC in the pool house. Sun loungers offer you all the comfort you will need. Pool towels and blankets provided. Summer kitchen with fridge freezer, sink, kettle, table and chairs. Picnic area between the Treehouse and the Shepherd's Hut. Exterior laundry area with washing machine, sink and drier. Exterior shed with play equipment ie tennis rackets, table tennis and boules equipment. Also water games and board games. The land is over two acres and is surrounded by trees and mountains. For any explorers and keen walkers this is a haven in the south of France. There are plenty of walking trails leading from the property. Enjoy numerous sunny terraces or shaded areas and a large fenced pool with waterfall, all with views from every angle onto the valley and mountain. Whether gathered around the kitchen, dining together on the terrace, enjoying an aperitif , or lounging by the pool, the feeling of space, tranquility, and authenticity make for a truly memorable holiday experience. The shops are only 10 minutes drive to supermarkets or the local town is also 10 minute. End of stay cleaning - Linens changed weekly unless agreed otherwise. Long weekends available at £1050 for three nights. Pool can be heated during winter months - £200 pw. Walkie talkies in each property. Cleaner can provide meals if required. There are no UK satellite TV channels but there is Netflix with News, French channels and a DVD player.